Neutrinos can travel through dense matter such as the Earth without interacting with a single atom, leaving no trace of their passage. To observe even just a few of the extremely rare interactions of neutrinos with matter, physicists build detectors with massive amounts of target material and operate them for many years. The detectors record the tracks of the particles that emerge from the rare collisions of neutrinos with atoms of the target material. The DUNE far detector will be installed in large caverns (green) 1,475 meters (4,850 feet) underground at the Sanford Underground Research Facility in Lead, South Dakota. 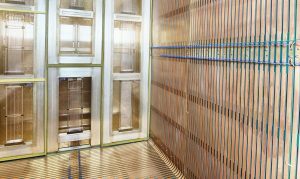 The DUNE collaboration will use state-of-the-art Liquid Argon Time-Projection Chamber (LArTPC) technology for the massive — but extremely sensitive — neutrino detector planned at the Sanford Lab site, called the DUNE Far Detector. This detector will be constructed and operated almost a mile (1.5 km) underground. 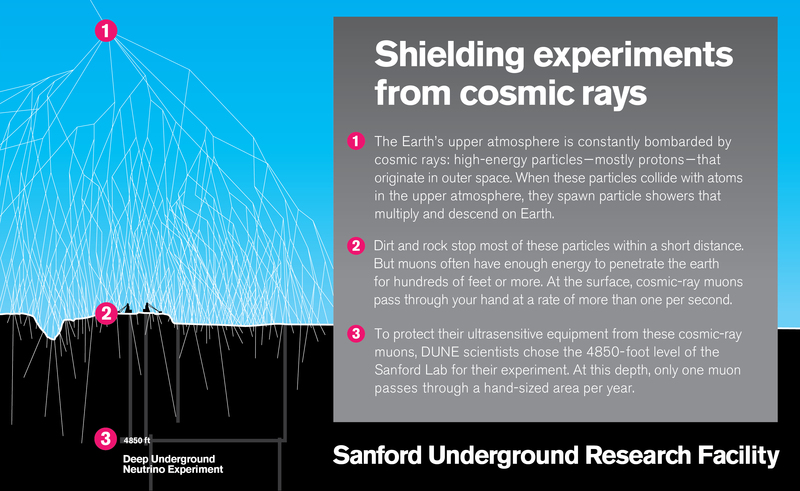 Cosmic ray muons, which constantly bombard Earth’s surface, would generate tracks in the detector if it were at the surface, complicating the data analysis. The large amount of rock above the Far Detector will absorb virtually all the incident cosmic rays before they reach the DUNE Far Detector. The detector is planned to consist of four separate modules, of two different designs, to be installed in two long caverns. Groundbreaking for the excavation of the caverns took place in July 2017. The detector modules will hold a combined total of 68,000 tons of liquid argon (LAr), which is the target material for neutrino interactions. Argon, a gas at room temperature, condenses to a liquid when cooled below -186°C (-303°F) and requires containment in well insulated cryostats and a sophisticated cooling infrastructure. The DUNE far detector will comprise four cryogenic modules, each of which will hold 17,000 tons of liquid argon. A central utility cavern will house the cryogenics system as well as electrical power equipment, air-handling units, and other support equipment. Within the fluid volume of each cryostat, neutrino interactions with argon atoms will produce ionization electrons that drift under the influence of a high-voltage electric field to detection elements that are either fully or partially immersed in the LAr, depending on the design: single-phase (fully immersed in LAr) or dual-phase (immersed partially in LAr, partially in gaseous argon). 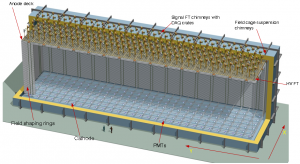 DUNE plans to construct the first module using the single-phase technology, and the second using the dual-phase. The choices for the third and fourth modules will come at a later date. 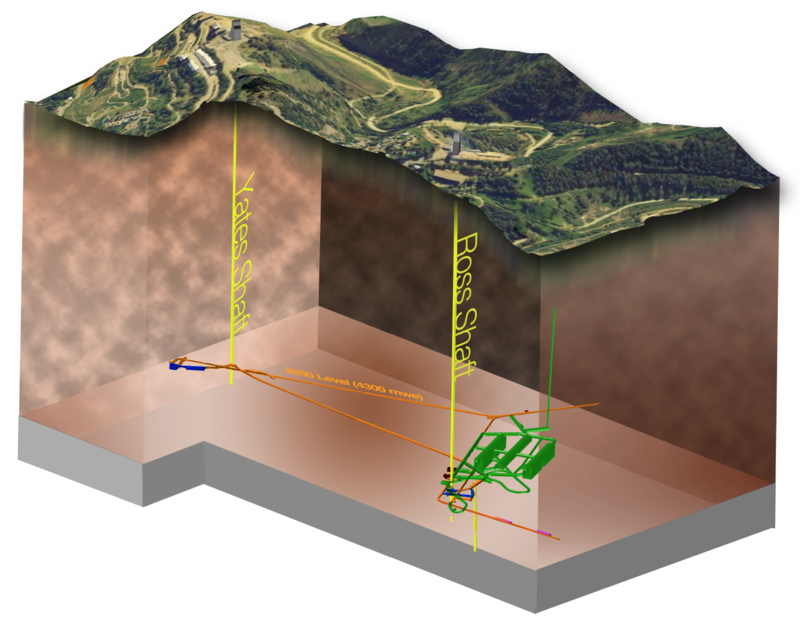 The DUNE detector technologies are described in detail in the experiment’s Conceptual Design Report. The four 17,000-ton DUNE Far Detector modules will comprise by far the largest liquid argon neutrino detector ever built. The DUNE collaboration is pursuing an aggressive program of building and testing detector components in preparation for Far Detector construction. 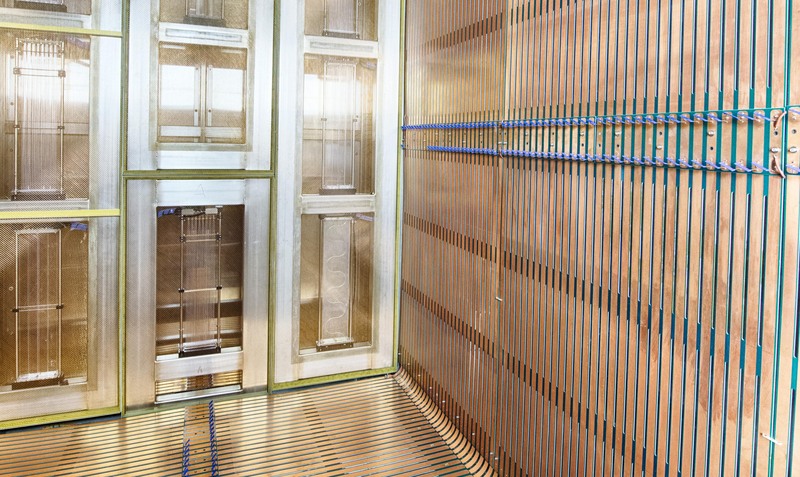 As of 2017, the two largest LArTPC neutrino detectors, both single-phase designs, are the ICARUS and MicroBooNE detectors. The single-phase technology employs a series of parallel wire planes to create a 3D image of the particle tracks created by a neutrino interaction. 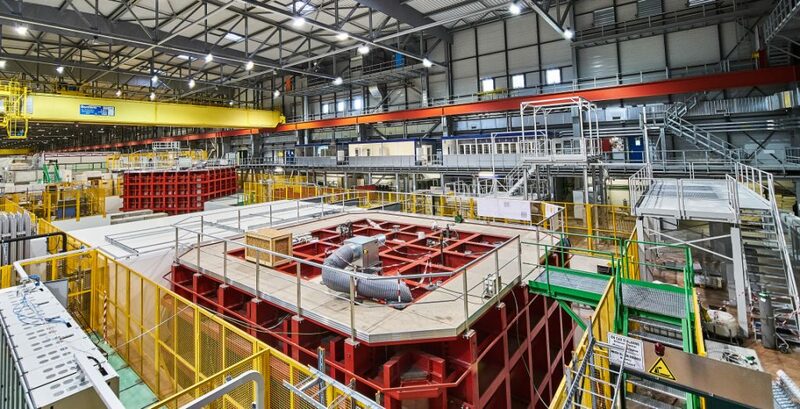 ICARUS holds 760 tons of liquid argon; it was originally operated at the INFN Gran Sasso laboratory in Italy, then refurbished at CERN, and transported to Fermilab in 2017 for operation in the Short Baseline Neutrino (SBN) program. The 170-ton MicroBooNE detector is currently taking data as part of the SBN program at Fermilab. The design for the DUNE single-phase Far Detector modules represents an evolution from these designs. 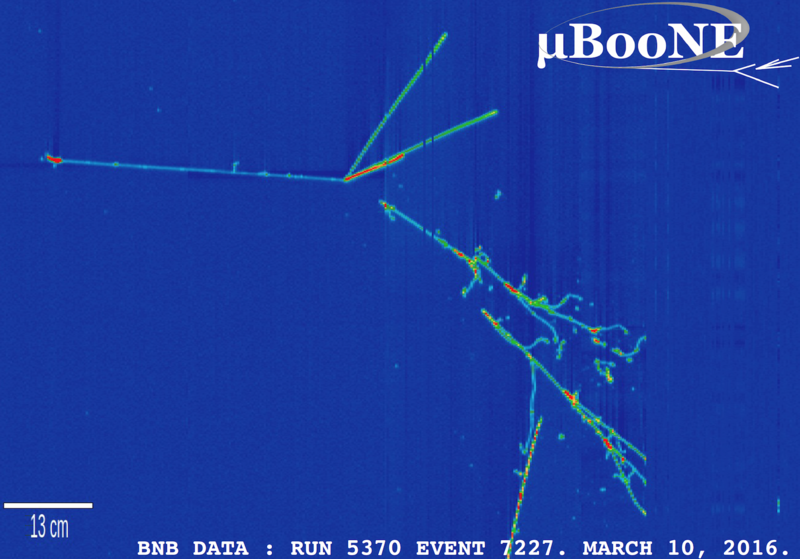 The image at left was recorded in one of the planes (the collection plane) of the MicroBooNE detector. 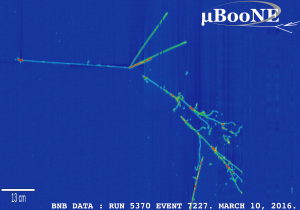 The long straight lines show ionization electron tracks and the shorter segments show particle showers. The colors correspond to the amount of energy deposited by the particle, ranging from red (a lot) to light blue (a little). The DUNE collaboration is constructing two 800-ton prototype detectors, called ProtoDUNEs, one of each design, at the CERN Neutrino Platform, with plans to operate them in late 2018 in a low-intensity particle beam provided by the CERN accelerator complex. Results of testing these prototypes will inform the final technology choices for the four Far Detector modules. A smaller, 35-ton prototype for DUNE was tested at Fermilab in early 2016. 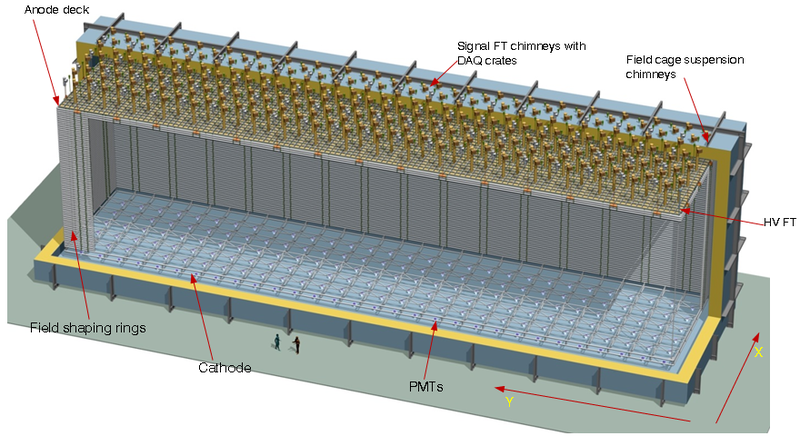 DUNE’s single-phase ProtoDUNE detector will consist of a small number of full-scale components of the single-phase Far Detector module design. The time-lapse graphic below illustrates the single-phase design’s principle of operation. A 30-second animation of the single-phase liquid-argon TPC technology. DUNE’s dual-phase ProtoDUNE detector will test an innovative modification of LArTPC technology in preparation for use in the second Far Detector module. This prototype detector features signal amplifiers that operate in a layer of gaseous argon above the volume of liquid argon. Relative to the single-phase, this technology promises a 20-fold increase in amplification of the faint signal produced by ionization electrons on the detection elements. This detector is preceded by the construction and operation of a smaller, 25-ton dual-phase prototype detector, also at CERN, in 2016-17. A design effort is underway for a fine-grained neutrino detector, referred to as the DUNE Near Detector, to be located at Fermilab a few hundred meters downstream of the neutrino source powered by the accelerator complex at Fermilab. This detector’s principal role is to characterize the neutrino beam in its initial state — before it travels 800 miles (1,300 km) to the far site — in order to better understand the signals collected at the Far Detector, and thus to maximize the neutrino oscillation physics potential of the DUNE experiment. In addition, the Near Detector will enable a rich program of particle physics measurements independent of the Far Detector and provide the data for many PhD theses. The Near Detector design is not yet finalized.